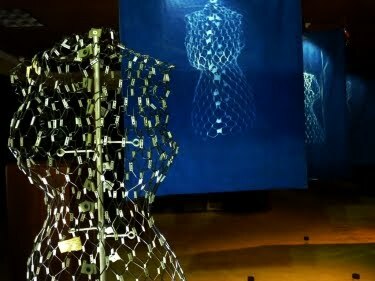 Colin Burke, Window Shopping installation featuring cyanotype images and the objects depicted. On Saturday night I participated in “For Artists Only,” a networking event for local artists organized by The Aldrich Contemporary Art Museum. The Aldrich, located in bucolic Ridgefield, Connecticut, tends toward thought provoking, New York-centric exhibitions, but through their Radius program, they try to help regional artists build careers. I tweetcasted the event live as 17 regional artists each made excellent five-minute presentations about their work. Here are my Tweets, with links (when available) to each artist’s work. 16. Julie Dotoli: Curvy line unpainted plywood shapes flat and interlocking in rearrangable groupings. 15. 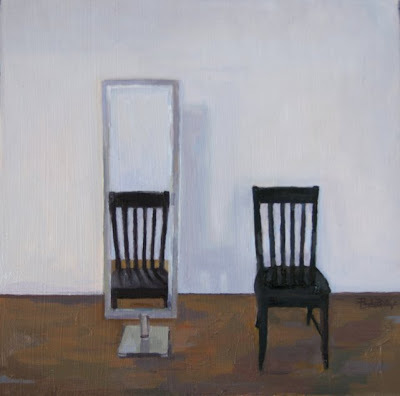 Paula Billups: Painterly realism, lonely enigmatic imagery, austere palette. 14. 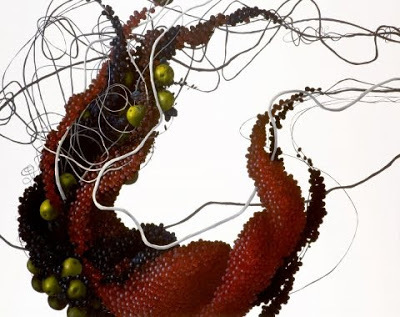 Lannie Hart: Steel, resin, pretty, grrl power. Doll-like figures explore. art history, myths, iconic imagery. 13. Sharon Butler: Images of work for upcoming exhibition @STOREFRONT, August 2010, with Cathy Nan Quinlan. Curated by Hrag. 12. CSU prof Mia Brownell paints fruit, food, and molecular structure. 11. James Sparks: Traditional painter, landscape hyperrealism. 6-12 months per painting. 10. Alan Taylor: Doodler. Black ink, colored pencil, enlarged and output digitally. 9. Matt Kinney–Big saws and wooden signs. He had shack in Beacon at Habitat for Artists, too! Small world. 7. Steve Hunter: Encaustics, intuitive markmaking channeling emotional states. Creation myths, superstition. 6. Leticia Galizzi: Acrylic collages about the impossibility of catching the whole. 5. Colin Burke: Cyanotypes of ordinary objects like shopping carts. 4. 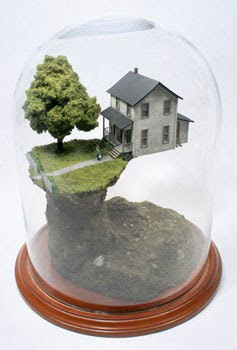 Thomas Doyle: mini diaramas based on notions of house and family life, under glass, address notions of unreliable memory. 3. Keith Ramcourt: Construction worker involved w color, surface, metaphor of industrial materials. Titles from naval sites. 2. Ladies Auxiliary: Domestic chores reframed as art projects. LOL. 1. Black and white photography by Joan Fitzsimmons . NOTE: If you are an artist who does not have a link in the list above, please send it to me and I’ll add it to your listing. Thanks! I love all that you share with the art world. Giveaway by Beth Cosner Designs is up on my site. Come visit and do spread the word!! Next Next post: Norbert Pragenberg’s question: What is my special idea?